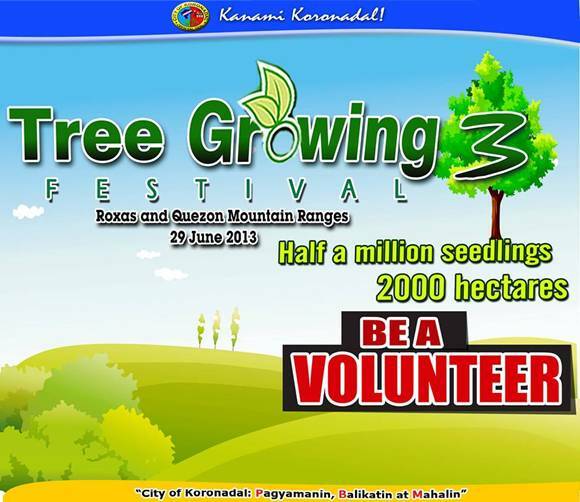 Join Koronadal City's Tree Growing Festival on June 29! The city government of Koronadal once again invites everyone to join and participate in the biggest tree planting activity in the city every year the Tree Growing Festival! Now on it's third year, the Tree Growing Festival aims to plant 500,000 seedlings in over 2,000 hectares of land in Roxas and Quezon Mountain Ranges. It will be held on June 29, 2013. In 2011, the first Tree Growing Festival was successful in planting more than 130,000 trees in 588 hectares in Roxas Mountain Range. The following year it has gathered more than 15,000 volunteers which planted more than 250,000 trees in 1,200 hectares in Quezon Mountain Range. Register now and become part of Tree Growing Festival 3, registration sites are located at the City Hall Lobby, KCC Mall of Marbel, Gaisano Grand Koronadal, Ace Centerpoint and at the main gate of the Koronadal City Public Market. For inquiries, contact the Tree Growing Festival Secretariat at (083) 228-8404, City ENRO at (083) 228-1732, CIO at (083) 228-6095 and CPDO-MIS at (083) 228-1740.